Background and Objectives: Myoepithelial cells (ME) are known to contribute in the patterning of salivary gland neoplasms (SGN) and possess cytoplasmic smooth muscle actin (SMA) revealed by alpha SMA (α-SMA). The present study aimed to assess the expression of α-SMA in selected benign and malignant SGN (pleomorphic adenoma printarticle.asp?issn=0377-4929;year=2018;volume=61;issue=4;spage=479;epage=484;aulast=Ravi, mucoepidermoid carcinoma (MEC), adenoid cystic carcinoma (ACC), and polymorphous low-grade adenocarcinoma (PLGA). Materials and Methods: The intensity and pattern of expression of α-SMA were studied in 25 cases of SGN's ACC (n = 7), MEC (n = 8), PA (n = 8), and PLGA (n = 2), and correlated with the histological patterns. Results: Maximum expression of α-SMA in the epithelial compartment was seen in ACC, followed by PA, whereas MEC and PLGA showed completely negative staining. The connective tissue expression was mild in ACC and MEC. The myxoid stroma of PA with “melting” pattern was weakly positive for α-SMA. The stroma in PLGA showed complete negativity. In ACC, α-SMA-positive cells were lining the cribriform spaces, small islands, and dispersed within large islands. Small nests showed complete positivity for α-SMA. Interpretation and Conclusion: In ACC, α-SMA expression supports the involvement of ME in epithelial organization explaining the histological patterns seen. In PA, the expression correlates with the predominantly secretory nature of ME. The absence of epithelial positivity in MEC and PLGA suggest that ME has less role to play in their histogenesis. The weak stromal positivity observed in MEC and ACC may be attributed to the positive immunoreactivity of myofibroblasts playing a role in modulating the course of SGN's. Tumors of the salivary gland are considered rare and complex due to the diverse cell population. This results in varying degrees of differentiation that gives rise to diverse histological patterns in specific neoplasms. Of the various theories, the multicellular histogenetic concept of salivary gland neoplasms (SGN) is the most accepted and suggests that various cell types present in the normal salivary gland could act as a precursor for neoplasia. ME cells are an integral part of SGN. Their morphology and numbers influence tumor patterns and also govern the characteristic stromal differentiation seen therein. One of the most common immunohistochemical markers used to identify the ME is alpha-smooth muscle actin (α-SMA), which is a ubiquitous contractile protein responsible for cell motility. It can be extremely useful in detailing the role of ME cells in the genesis of SGN as these ME are known to modulate the invasive and malignant growth potential of the SGN. α-SMA is also used for the identification of myofibroblasts (MF), which are specialized actin-containing fibroblasts whose role in progression of various malignant tumors has been proved by numerous studies. The present study was an attempt to assess the expression of α-SMA in pleomorphic adenoma (PA), mucoepidermoid carcinoma (MEC), adenoid cystic carcinoma (ACC), and polymorphous low-grade adenocarcinoma (PLGA), and elucidate the role of α-SMA-positive cells in morphological patterning and progress of the selected benign and malignant salivary gland tumors. We also evaluated the immunohistochemical expression of α-SMA with various tissue patterns in the epithelial compartment (e.g., ductal, tubular, cribriform, solid, and cystic patterns) and stromal compartment (e.g., myxoid, chondroid, and mucinous stroma) and correlated the same with the histogenesis and clinical behavior of the SGN (i.e., benign tumors and low-grade and high-grade malignancies). 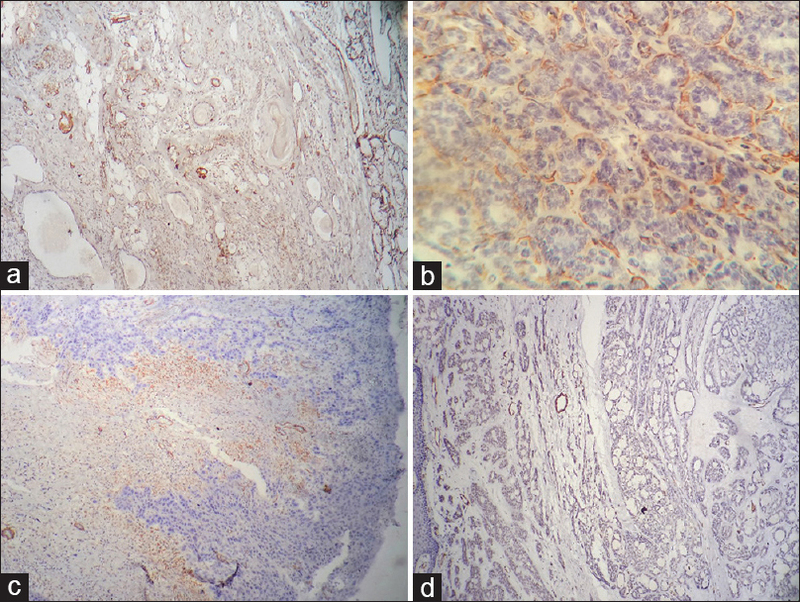 This retrospective study assessed the immunohistochemical expression of α-SMA in formalin-fixed and paraffin-embedded tissue blocks of 25 cases of selected benign and malignant SGN. These included cases of ACC (n = 7), MEC (n = 8), PA (n = 8), and PLGA (n = 2) that were retrieved from the archives of our department. The lesions selected for the study include benign, low-grade and high-grade malignancies with differing patterns, and prognosis that enabled us to evaluate the influence of the ME (through the differential expression of α-SMA) on their patterning and invasive nature. The present study commenced after obtaining clearance from the Institutional Ethics Committee. Two tissue sections each of 4-μm thickness were taken from each block (one on Poly-L-Lysine-coated slide for IHC, and the other on egg albumin-coated slide for H and E staining). The sections on Poly-L-Lysine-coated slides were then subjected to antigen retrieval using pressure cooker method using citrate buffer (pH 6), followed by endogenous peroxidase block (3% H2O2 for 10 min). The slides were then incubated with primary antibody, that is Mouse monoclonal alpha SMA (clone: 1A4) (BioGenex Laboratories, Inc. 49026 Milmont Drive, Fremont, CA 94538, USA; Cat. No. AM128-5M) for 60 min and secondary reagents (BioGenex Laboratories, Inc. 49026 Milmont Drive, Fremont, CA 94538, USA; Cat. No. QD420-YIKE) as per the manufacturer's instructions. Subsequently, they were counterstained with Mayer's hematoxylin for 10 min, dehydrated, cleared, and mounted with DPX. The scoring system followed by Edward et al. (based on the percentage of positively-stained cells in each tumor) was used to assess the epithelial and connective tissue staining characteristics of α-SMA in each of the four groups of SGN. Staining was considered positive if >10% of cells exhibited immunoreactivity and were scored as follows: Score 0: absent (<10%), Score 1: weak (10%–25%), Score 2: mild (26%–50%), Score 3: moderate (51%–75%), and Score 4: strong (76%–100%). The assessment was performed by two observers independently and interobserver agreement of the α-SMA staining in the epithelial and connective tissue components was assessed using Kappa statistics. In ACC and PLGA, ten high-power fields were observed for each pattern of tumor cell arrangement that included ductal and cribriform patterns, nests having <15 cells, and islands having 15–50 cells and large islands with >50 cells. The pattern of expression of α-SMA was noted in each of these histological patterns and categorized as either completely stained, peripherally stained, stained cells dispersed in the islands, and negatively stained. In MEC, the patterns observed were cystic lesions with or without arcading arrangement, islands, and nests as well as sheets of epidermoid cells. The cells were categorized as clear/intermediate/epidermoid/spindle cells and the expression of α-SMA was visualized and tabulated in different cell types and patterns observed. In PA, the assessment was done individually in various histopathological patterns (ductal component, abluminal region, solid, and chondromyxoid) as observed in the cases. The pattern of expression of α-SMA was compared between the lesions and within the lesions using Chi-square test and Fisher's exact Chi-square test when required. SPSS version 20.0 (IBM Corp. Released 2011. IBM SPSS Statistics for Windows, Version 20.0. Armonk, NY: IBM Corp.) was used for statistical analysis. Islands and nests of ACC, PLGA, and MEC were compared amongst each other to understand the role of ME in patterning and distribution. The assessment of α-SMA in the epithelial component was done as proposed by Edwards et al. A statistically significant difference (P < 0.001) was observed with regard to the grade of α-SMA immunoreactivity in the epithelial component of each tumor type. Five of eight cases (62.5%) of ACC showed moderate positivity and five of seven cases (71.4%) of PA showed mild positivity. MEC and PLGA were completely negative for epithelial staining with α-SMA. There was an excellent agreement between the two observers with 22 of 25 (88%) cases in agreement with a kappa value of 0.833. Immunoreactivity of α-SMA in the connective tissue component of all four tumor types (ACC, MEC, PA, and PLGA) included in the study was compared using Fisher's exact Chi-square test. Most of the lesions showed predominantly weak immunoreactivity for α-SMA in the connective tissue. MEC accounted for 50% of the few cases that were moderately stained. Among the cases that stained mildly, ACC and PA accounted for 40% each. None of the cases of PLGA showed α-SMA staining in connective tissue. The assessment of staining characteristics in the connective tissue was subjective with agreement seen only in 16 of 25 (64%) cases with a kappa value of 0.458 indicating a moderate agreement. Comparison of the staining of epithelial and connective tissue components of the individual lesions revealed that ACC showed moderate epithelial staining and predominantly weak connective tissue staining. MEC showed no epithelial staining but weak connective tissue staining. PA showed mild epithelial and weak connective tissue staining. PLGA was negative for both epithelial and connective staining [Table 1] and [Figure 1]. On comparison of expression of α-SMA in various histological arrangements seen in ACC, predominantly peripheral staining was observed in ductal or tubular pattern where the α-SMA positive cells were seen abluminally, in small islands and cells lining the cribriform spaces. Complete staining was observed in small nests and in the trabecular pattern. The dispersed staining pattern was seen in large islands. Peripheral staining was also seen in 63% of the cells showing cribriform pattern, but the α-SMA-positive cells were lining the luminal surface of cribriform spaces. Complete α-SMA positivity was seen in 97.9% of the nests (<20 cells; width of tumor aggregates was <five cells abreast) and in all cells (100%) in the trabecular pattern. Smaller islands showed predominantly peripheral staining (84%). Dispersed staining was observed in 60.9% of large islands (>50 cells) [Table 2] and [Figure 2]. Among the eight cases of MEC studied, the most common histologically evident pattern was cystic with arcading of predominantly intermediate cells followed by the presence of smaller nests (<20 cells) in four cases, small islands in two cases and the presence of sheets in one case. Epithelial cells presenting either as cystic lining with arcading, epidermoid, or intermediate cells were negative for α-SMA [Table 3]. Of the eight cases, seven cases (87.5%) showed α-SMA positivity either juxta-epithelially in clear cells or in dispersed spindle cells in the connective tissue. While spindle-shaped cells were a consistent morphological finding in the connective tissue of all cases of MEC, 75% of them were positive for α-SMA [Figure 1]. Of the seven cases of PA studied, four cases (57.14%) showed α-SMA positivity in isolated cells. In five of seven cases (71.42%), clustered or streaming cells showed α-SMA positivity. In one of seven cases (14.28%), the plasmacytoid cells stained positive for α-SMA. Of all the cuboidal cells that were examined, cells in the periductal region and those forming the melting pattern showed 100% positivity for α-SMA [Figure 1]. SGNs are a rare group of lesions whose histogenesis has always been debatable. The multicellular histogenetic concept proposed by Dardick suggests that any of the various cell types (i.e., ductal, intercalated, striated, myoepithelial, and basal cells) present in the normal salivary gland could act as a precursor for neoplasia. It is essential to understand the role of ME in the patterning of a tumor that accounts for the histological heterogeneity, that is characteristic of SGN. ME are derived from neural crest cells and have smooth muscle-like properties due to the presence of actin which is a 32 KD protein. α-SMA is one of the six vertebrate isoforms of actin and is distributed throughout the cytoplasm of ME and is responsible for its contractile function. Under neoplastic conditions, ME could differentiate into epithelial as well as mesenchymal components and are, therefore, called as the “Neoplastic ME (NME).” This study attempted to determine the role of ME in selected SGN by the assessment of α-SMA, an immunohistochemical marker for ME. Savera et al. noted the expression of α-SMA in better differentiated neoplastic myoepithelium and found the expression of smooth muscle-specific proteins, i.e., actin and myosin in the neoplastic myoepithelium to be associated with morphologic differentiation. Considering α-SMA as a marker of myoepithelial differentiation, lack of its expression in the epithelial component of MEC and PLGA [Table 1] suggests that there is no participation of ME in their histogenesis. Focal positivity in the connective tissue stroma in MEC could be attributed to MF. Our findings support the study by Prasad et al. who had obtained similar results in their immunohistochemical study on MEC and PLGA. It may be suggested that ME assume different roles in various lesions as they may influence epithelial differentiation and patterning in ACC while having a predominantly secretory role in PA. In ACC, we observed that ductal or tubular patterns showed predominantly abluminal distribution of α-SMA-positive cells (94.5%) which we recorded as “peripheral” staining. Furthermore, 63% of cases which exhibited cribriform pattern showed peripheral staining, but the α-SMA-positive cells were seen lining the luminal surface of cribriform spaces [Table 3]. These findings mirror those of Hirano et al. who found a similar expression of α-SMA in ACC with the isoform of actin (1A4), that is similar to that used in this study. In ACC, the cribriform pattern is said to be formed by the NME that are in initial stages of differentiation and still retain the ability to influence the polarization of proliferating ductal cells to form lumina. The epithelium in large neoplastic islands showed a dispersed pattern of immunoreactivity to α-SMA indicative of the limited distribution of ME. The lesser numbers of ME do not participate in the polarization of luminal epithelial cells, thereby failing to form ducts. The same has been proved by electron microscopic studies on different types of ME by Margaritescu et al. The patterning ability of the ME has also been studied by Gudjonnson et al. in normal and tumor-derived ME in the breast. Their critical finding was the ability of ME to secrete laminin-1 which was responsible for the polarization of luminal epithelial cells, thereby resulting in duct formation. Based on this study, we understand that ME cause ductal differentiation mediated by laminin-1 secretion. The participation of ME in the formation of ductal and cribriform patterns of ACC can thus be evidenced by the peripheral staining of these cells that were observed in the study. As we observed variable expression of α-SMA, we may also surmise that the tumor is developed from a mixture of ductal and abluminal cells by any of the three scenarios mentioned below. (i) The smaller nests were completely stained indicating that they are composed only of ME cells,(ii) The predominance of ductal cells leads to the formation of solid islands, and (iii) Equal proportion of both cells leads to the cribriform pattern (i.e., ME influence the ductal cells to lumenize). We observed strong positivity in cells present in the periductal region with a moderate staining intensity in those forming the melting pattern in the myxoid stroma and in some isolated spindle cells in the stroma. These findings support those of Deyhimi et al. who found strong immunopositivity in only 1 of 25 cases of PA with an equal distribution of 12 cases each showing weak and absent staining. Similar results have also been reported by Rasheed who immunohistochemically studied the role of ME in PA and MEC in salivary glands using α-SMA. A thorough review of the literature on cells involved in the genesis of PA has shed light upon myoepithelial-like cells called the 'MME ' which are formed as a result of metaplasia, dedifferentiation, and transdifferentiation of NME. They may appear as stellate cells in stromal, myxoid, and chondromyxoid areas of the tumor, as fusiform “myoid” cells in the fascicular proliferating areas, as polyhedral hyaline cells or clear cells. An electron microscopic study of MME in PA by Margaritescu et al. has clearly described them as cells characterized by focal linear plasmalemmal densities, basal lamina, well-differentiated desmosomes, and microvilli-like cytoplasmic processes and more importantly lack of myofilaments. The ME that are initially located around the ductal structures proliferate and start secreting the extracellular matrix, thereby losing their cell junctions, they then tend to move away and characteristically “melt into the stroma” which is a distinguishing histological feature of PA. Ultrastructural studies also support the transition of these epithelial cells, as with movement of the cells away from the ducts, they tend to lose their epithelial nature, and attain more mesenchymal characteristics that result in diverse patterns seen in PA like the chondromyxoid and osseous areas. The ME participation and its contribution to the histological diversity seen in PA have thus been substantiated in the small sample in our study too. Both cases of PLGA included in our study showed total immunonegative staining for α-SMA. While we acknowledge the insufficient number of cases to arrive at a satisfactory conclusion, the lack of staining in PLGA mirrors the findings of Prasad et al. who reported a completely negative staining of three sensitive smooth muscle markers (α-SMA, calponin, and SMMH) in all 27 cases of PLGA studied. They explained the negative staining by suggesting the possible presence of “MME “ that lack myofilaments to bind to the antibody marker. The present study suggests that the ME influence the patterning of the epithelial and connective tissue compartments of the SGN. In ACC, they are considered to play a role in epithelial organization, whereas in PA they are predominantly secretory. The study findings endorse the concept of subpopulations of ME, namely the NME and MME. The former cells showed the intense staining with α-SMA in ACC and the latter cells showed weak staining in PA probably due to the loss of some myofilaments. Completely negative staining in the epithelial component of MEC and PLGA suggests the absence of ME in their pathogenesis and lends credence to the role for striated duct cells and basal cells in the histogenesis of these lesions. This may be substantiated by further studies that can elaborate on the role of individual components of the salivary ducto-acinar unit in the genesis of various SGN. We found α-SMA to be an efficient immunohistochemical marker for ME and endorse that its differential expression in the epithelial and stromal compartments of the selected salivary gland lesions influences their morphological patterning, especially in ACC. The presence of ME may be associated with a better prognosis as the proportion of α-SMA-positive cells was less in high-grade ACC (solid variant) and MEC which have worse outcome. Dardick I. Histogenesis and morphogenesis of salivary gland neoplasms. In: Ellis G, Auclair P, Gnepp D, editors. Surgical Pathology of Salivary Glands. Philadelphia: W.B. Saunders Co.; 1991. p. 108-28. Dwivedi N, Agarwal A, Raj V, Chandra S. Histogenesis of salivary gland neoplasms. Indian J Cancer 2013;50:361-6. Chitturi RT, Veeravarmal V, Nirmal RM, Reddy BV. Myoepithelial cells (MEC) of the salivary glands in health and tumours. J Clin Diagn Res 2015;9:ZE14-8. Edwards PC, Bhuiya T, Kelsch RD. 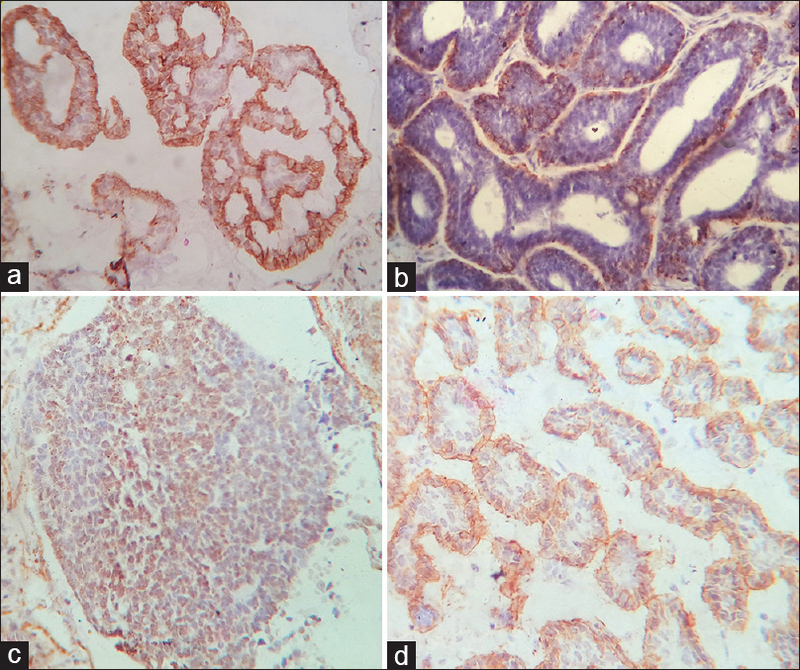 C-kit expression in the salivary gland neoplasms adenoid cystic carcinoma, polymorphous low-grade adenocarcinoma, and monomorphic adenoma. Oral Surg Oral Med Oral Pathol Oral Radiol Endod 2003;95:586-93. Dardick I. Morphogenesis and pathogenesis. In: Dardick I, editor. Color Atlas/Text of Salivary Gland Tumor Pathology. New York: Igaku-Shoin Medical Publishers; 1996. p. 24-5. Lehman W, Morgan KG. Structure and dynamics of the actin-based smooth muscle contractile and cytoskeletal apparatus. J Muscle Res Cell Motil 2012;33:461-9. Savera AT, Gown AM, Zarbo RJ. Immunolocalization of three novel smooth muscle-specific proteins in salivary gland pleomorphic adenoma: Assessment of the morphogenetic role of myoepithelium. Mod Pathol 1997;10:1093-100. Prasad AR, Savera AT, Gown AM, Zarbo RJ. The myoepithelial immunophenotype in 135 benign and malignant salivary gland tumors other than pleomorphic adenoma. Arch Pathol Lab Med 1999;123:801-6. Hirano T, Gluckman JL, deVries EJ. The expression of alpha vascular smooth-muscle actin in salivary gland tumors. Arch Otolaryngol Head Neck Surg 1990;116:692-6. Margaritescu C, Raica M, Florescu M, Simionescu C, Surpateanu M, Jaubert F, et al. The ultrastructural aspects of neoplastic myoepithelial cell in pleomorphic adenomas of salivary glands. J Cell Mol Med 2004;8:369-81. Gudjonsson T, Rønnov-Jessen L, Villadsen R, Rank F, Bissell MJ, Petersen OW, et al. Normal and tumor-derived myoepithelial cells differ in their ability to interact with luminal breast epithelial cells for polarity and basement membrane deposition. J Cell Sci 2002;115:39-50. Pia-Foschini M, Reis-Filho JS, Eusebi V, Lakhani SR. Salivary gland-like tumours of the breast: Surgical and molecular pathology. J Clin Pathol 2003;56:497-506. Rasheed F. Immunohistochemical expression of actin and S100 in pleomorphic adenoma and mucoepidermoid carcinoma. J Bagh Coll Dent 2011;23:51-5. Cirri P, Chiarugi P. Cancer associated fibroblasts: The dark side of the coin. Am J Cancer Res 2011;1:482-97. Gabbiani G. Evolution and clinical implications of the myofibroblast concept. Cardiovasc Res 1998;38:545-8. Gupta V, Ramani P, Chandrasekar T. A clinico-pathological and immunohistochemical study of salivary gland tumors: A 5 year Indian experience. Int J Oral Maxillofac Pathol 2012;3:15-22. Deyhimi P, Mahzouni P, Torabinia N. Study of myoepithelial cell markers in pleomorphic adenoma and mucoepidermoid carcinoma of salivary glands. Dent Res J 2006;3:1-9.